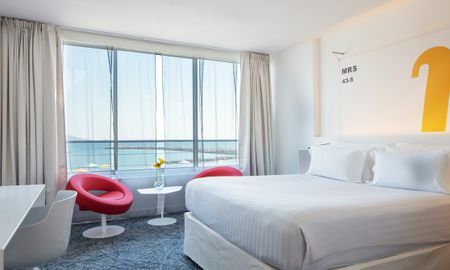 The nhow Marseille is situated in one of the most beautiful bays in the Mediterranean, offering exceptional sea views. Skilfully constructed on a rocky hillside, the hotel is the perfect destination for dream holidays and is one of Marseille’s biggest meeting and event venues. The hotel comprises 150 airy and modern guestrooms, most of which are sea-facing with their own balcony or terrace. Family rooms and rooms for guests with reduced mobility are also available. Guests can enjoy the hotel’s generous buffet for breakfast, with the hotel restaurant serving delicious Mediterranean cuisine for lunch and dinner. Snacks are also on offer at the hotel bar. Guests can unwind in the swimming pool overlooking the sea, open from May through until October. Alternatively, guests can work out with the exercise machines in the sports hall or be refreshed and rejuvenated by with a relaxing treatment or massage at the hotel spa. The nhow Marseille features 16 fully-equipped conference and meeting rooms, including a large auditorium which can accommodate up to 500 guests. The Nhow Marseille is only several minutes from the beach and Marseille’s Palais des Congrès.